I really envy people who have mothers, grandmothers and aunts who bake. My mother never even cooked with garlic much less eggs. Traditional food was the norm in the conservative family. And then later I shocked them all by bringing home some eggs (gasp! ), baking regularly like its part of my daily routine. My family is now quite accustomed to my obsession, they rest assured all's well in my world as long as I bake frequently. If I had a mother or aunt who baked, I would probably be the proud successor of a few tins and tools. I would have fiercely guarded those heirloom handwritten recipes in that dog-eared diary. Recipes I could fall back on and compare other recipes with. I would blog about recipes like 'Mom's Famous Fruit Cake' Or 'Gran's Best Ever Pound Cake' and I would challenge there just can't be another like this. For now, riding on my (plump) shoulders is the great responsibility of trying out and building a small repository of tried and tested recipes for my children. Ever since I baked those little Spiced Carrot Macaroons, I have been wanting to bake a carrot cake with the same flavors. Yotam Ottolenghi 's famous Carrot Walnut Cake the obvious choice. 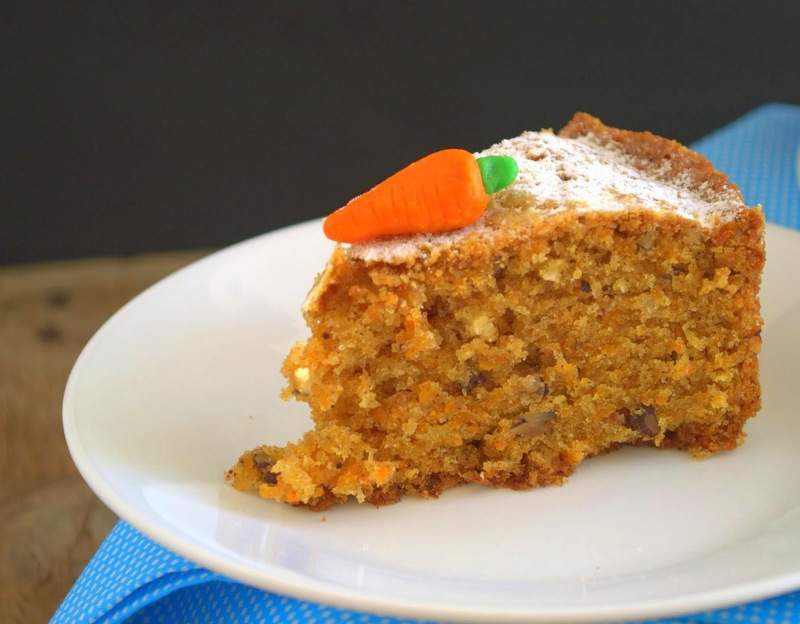 Turned out to be a moist one flecked with carrots, coconut, toasted walnuts, spices and orange zest. Hubby loved it as the texture and spices are reminiscent of a fruit cake, albeit a light one. I am honestly not sure if my cake had the texture its meant to have, but it was tasty and I really did not miss the frosting. I think this cake tastes better the day after it is baked, so do save some. 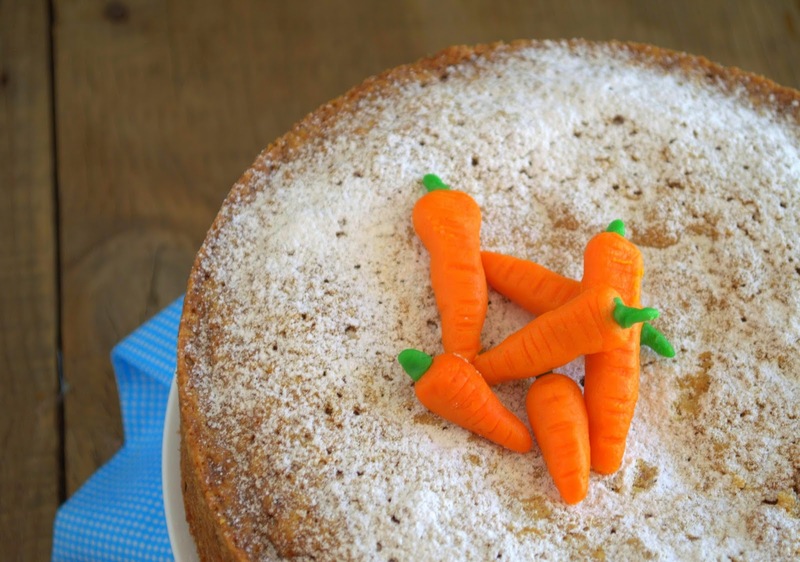 I had grated the carrots in a small holed grater making them almost invisible in the cake. Slightly thickly grated carrot will add more texture and visual appeal too. Will increase the quantity of nuts next time. 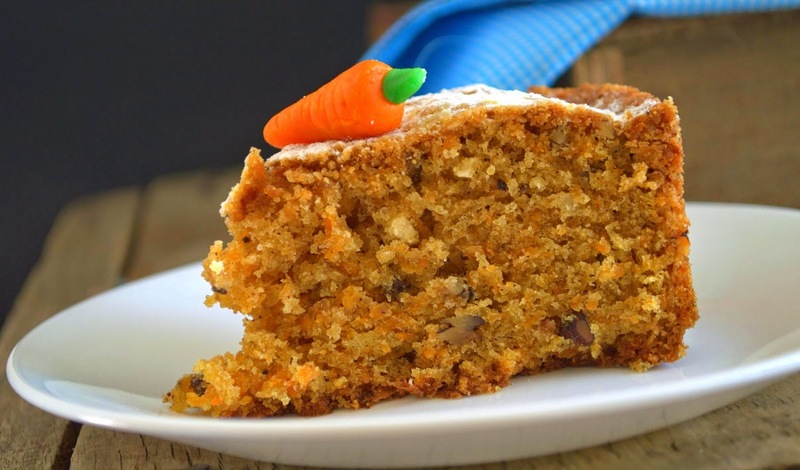 If like me, you have never tasted or baked a carrot cake, here is a good one you could start with. Grease, dust and line an 8 inch (20 cm) round spring form tin. Line the sides too with parchment. I did not line the sides. Pre-heat oven to 170 C.
Weigh all dry ingredients first, wash and dry your measuring bowl. Weigh egg whites first and then the rest of the wet ingredients. To beat egg whites : A medium sized bowl and beaters of your hand mixer, 2 small cups to drop the whites in. Another small bowl to drop the yolks in. All of these need to be really clean and free of even a speck of grease. Sift together the flour, baking powder, soda, salt, cinnamon and clove powders. In another small bowl, lightly whisk together the whole egg, egg yolk, orange zest and vanilla. Beat the egg whites till stiff peaks form. Do this first before you use the hand mixer for beating the oil. Take the oil and sugar in a large mixing bowl, beat on medium speed (speed 2) for a minute. On low speed, slowly add the beaten egg, beat 30 seconds just to incorporate. Using a spatula, mix in the walnuts, coconut and carrots. Gently fold in the flour mixture. Do not over mix as you will be mixing more when you fold in the egg whites. Now gently fold in the beaten egg whites in 3 additions. Be careful to not over mix, a few streaks of white here and there are OK.
Pour the mixture into the cake tin and bake for about 55 minutes to an hour. Check at 55 minutes. A tester should come out dry. Cover the cake with foil if the cake browns too much before its fully baked. Let the cake cool completely before removing from the tin. I removed it after 5 minutes and cooled on the rack. To make the icing : Beat the cream cheese until light and smooth. In a separate bowl, beat the butter, icing sugar and honey until light and airy. Fold together the cream cheese and butter mixture. spread on top of the cake, sprinkle with the toasted walnuts. Alternatively, decorate with marzipan carrots with neon green stems. Please note : If the whites are not beaten right and folded in right, the cake may be denser. But it should still be tasty. The recipe gives the baking time as 60 minutes and for this cake I had set my timer for 70 by mistake. The second cake I baked was done at 55. Do not over bake as the cake may feel dry. I have sliced the cake soon after it cooled. If you can be more patient, you should be rewarded with neater slices! Your anecdotes, candour, humour always leave me smiling and I wait for you next post to come back and read more and more. Never mind that most of the recipes have egg, and my home is still conservative ;-)and never mind that I end up not making several of your recipes for want of patience to try out an egg substitute. IMO, you have more than made up for lack of baking legacy at your home with this vast exhaustive site. So chin up, and keep dishing out these lovely verbal and virtual teats for us to enjoy! Hi, you have a nice way of writing/narrating. Have you ever thought of writing fiction or non-fiction? Your passion for baking is truely inspiring. :) I also enjoy baking once a while mostly for my daughter.